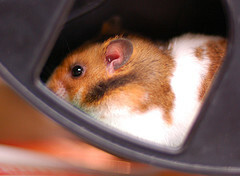 You are here: Home / Employee Engagement / Employees as Hamsters: A “Wheely” Big Deal? Employees as Hamsters: A “Wheely” Big Deal? Employees as hamsters. A recent large scale employee engagement survey categorized some workers as hamsters: “those working hard but at the wrong things.” Initially I thought it was a cute image to understand engagement. Later I began to wonder about the appropriateness of using the term hamster to refer to employees. (working hard but at the wrong things)? 54 participants said yes and 58 participants said no. If the story line helps to understand the behavior it probably is appropriately used notwithstanding that it does not make us warm and fuzzy inside. It’s all in how you say it. I think it’s pretty funny, and would disarm people a bit, and at the same time they’d get it. It’s an image that people can immediately grasp, and is therefore a powerful one. I don’t have a problem with the reference (though I’m just not sure that a hamster is the right animal metaphor for this group)…but then it’s all in how it’s used as a way to help organizations and employees…if it’s used in a derogatory way then it’s inappropriate. As I read leadership blogs, I see managers referring to front line staff as though they’re a different species. I hate to see anyone being *that* obvious about it, though. Engagement properly understood is not about the employee at all; it’s about the organization and how well the org is ENGAGING its… hamsters. We should refer to the leader of that group as an Ostrich. Yeah…referring to people as rodents who poop in wood shavings is such a way to inspire them. Yeesh. Whereas the behavior may parallel that of hamsters, people are intelligent, sometimes misguided, confused, or mismanaged, people are not without willpower. Oh my gosh! I can’t imagine how negative the reaction would be if any of those employees saw that category! My thoughts. It seems like the overall response is quite divided. My own response has been influenced by this. If the term was seen negatively by even a small percentage of the sample then I will not use it. I believe it was an attempt at a playful and “sticky” categorization but it is viewed by many as disrespectful. R- E-S-P-E-C-T, find out what it means. Without respect, conversational safety it at jeopardy in the workplace. I will avoid references to people as small furry animals as these are the people I want to work with to achieve full engagement. Of course I also don’t like people being referred to as resources or capital as in human resources or human capital. Just human. Perhaps we can just leave humans as humans! David, I started to head toward the ‘no’ camp but then I came back to what (I think) was the original intent behind the metaphor: spinning madly in the little wheel but really going nowhere. Still not the best since you’re referring to someone as a rodent (and I hated Who Moved My Cheese for that very same reason…as well as being didactic). Glad you’re going with the ‘no’ approach. The more I think about it, the more I believe there’s a better way to engage employees and coach them in working smarter in building traction in their actions. As always, many thanks for progressing the discussion – the blog, forum and resources you provide are fantastic. Regarding the “Hamster” debate, I would encourage everybody to grab a copy of the free report from our website ( http://www.blessingwhite.com/research ) and read more about the research and the categories – I hope that even the folks who don’t like the choice of label will get something from the analysis, the model and the reccomendations we make. Ah, the yes and no of calling employees hamsters I found this a very helpful exercise in respectful language and I think I have been guilty at times in leadershin in being cute but perhaps disrespectful. Thanks for letting people know about the link to the report Fraser. In being respectful in the original article I never attached the term to Blessing White, it was not my intent to point fingers at anyone it was my intent to look at terms and opinions. I find it a negative. It’s better to treat each employee as an individual instead of lumping them together. Yes, we all need to work as a team, but it sounds like a put down. I wouldn’t want to be called a hamster and I don’t think any of my co-workers would either. Glad you are taking it all in and making an informed decision.